Box Text: *All the top, officially licensed SUVs and trucks By Chevrolet, GMC, Dodge, Jeep, Ford, Toyota, Lexus, Nissan, and Mitsubishi. *Go for the glory and any time during the day or night, in every kind of weather imaginable. *Accurate physics, photo-realistic graphics, and unforgiving artificial intelligence. 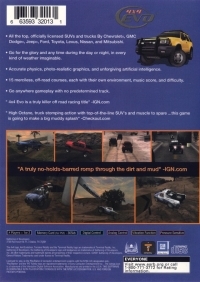 *15 merciless, off-road courses, each with their own environment, music score, and difficulty. *Go anywhere gameplay with no predetermined track. 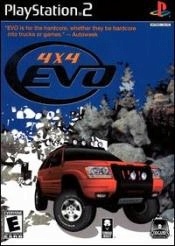 This is a list of VGCollect users who have 4x4 Evo in their Collection. This is a list of VGCollect users who have 4x4 Evo in their Sell List. This is a list of VGCollect users who have 4x4 Evo in their Wish List.